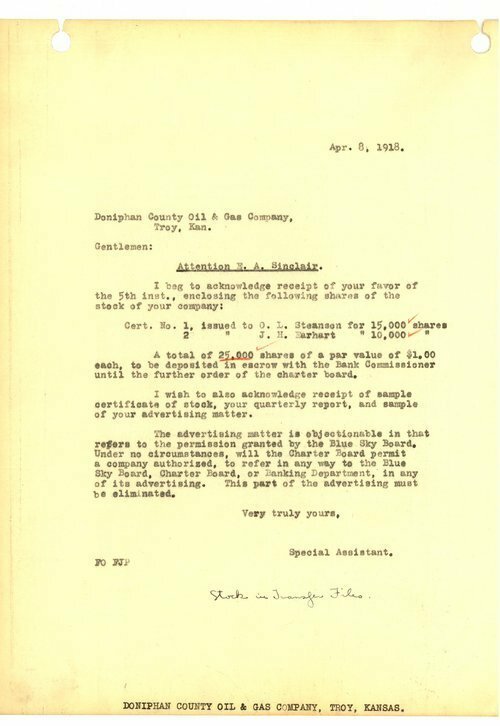 This letter was written by a special assistant of the State Bank Commissioner to E. A. Sinclair, Doniphan County Oil & Gas Company, Troy, Kansas. The letter acknowledges receiving the listed Doniphan County Oil & Gas Company's stock certificate numbers, the stockholders' names, and the number of shares owned by each person that were submitted to be held in escrow by the Bank commissioner to comply with the recently passed Blue Sky law.. Also, the letter states that the Doniphan County Oil & Gas Company cannot refer to the Blue Sky Board, Charter Board, or the Banking Department in their advertising. Call Number: Records of the State Bank Commissioner's Office and the Kansas Corporation Commission, Escrow Record (Receipts), c.1917-1936, vol. 1.